Have you ever wanted to hear Danny Trejo as Boots telling Benicio Del Toro's Swiper, "Swiper no swiping?" 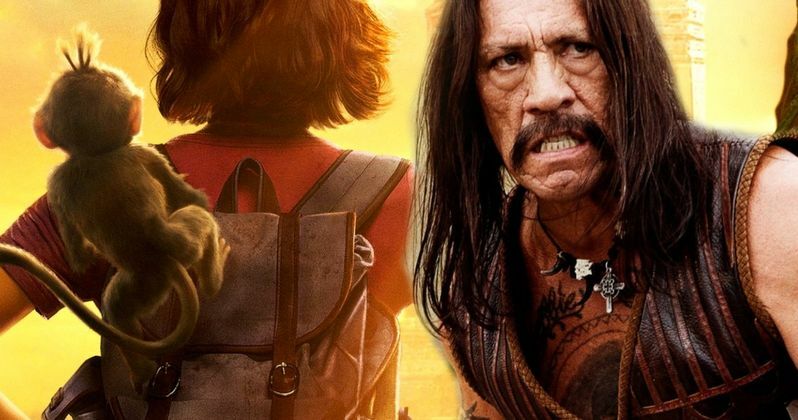 You're in luck if you said yes because Trejo has just revealed that he is providing the voice of Boots the Monkey in Dora and the Lost City of Gold. This seems a bit puzzling, but we should get some clarification as to what we're about to see when the first trailer drops this weekend during the Nickelodeon Kid's Choice Awards. After the Dora and the Lost City of Gold posters were released this morning, Danny Trejo announced the great news. The Machete actor posted, "The rumors are true, I finally can tell you I am a monkey... Boots!!!" Fans noticed right away that Boots isn't wearing any boots in the posters. However, this may change at some point during the course of the movie, which might also explain how much Boots' voice has changed since his Nickelodeon cartoon days. The addition of Danny Trejo as Boots in Dora and the Lost City of Gold is a puzzling one, but it is also great. This fact alone leads one to believe that we could be getting something that is pretty funny for both adults and kids. Just the thought of being able to hear Trejo's Boots against Benicio Del Toro's villainous Swiper is going to be enough to get people into theaters that more than likely would not have seen the movie in the first place, which is always a good thing. Isabela Moner plays Dora in the big screen adaptation, which is merging live-action with CGI. In addition to Moner, Danny Trejo, and Benicio Del Toro, Dora and the Lost City of Gold features Eva Longoria, Temuera Morrison, Jeffrey Wahlberg, Michael Pena, Pia Miller, Q'orianka Kilcher, Eugenio Derbez, Adriana Barraza, and Madeleine Madden. It's going to be interesting to see how the cast interacts with Del Toro's Swiper and Trejo's Boots. Del Toro seems like the perfect person to voice the villain and we're wondering how many times he's going to steal Dora's iconic backpack. Dora and the Lost City of Gold opens in theaters on August 2nd. The movie is directed by James Bobin from a script written by Nicholas Stoller and Danielle Sanchez-Witzel. It was originally believed that Michael Bay and his Platinum Dunes partners were going to produce, but that was later proven to be false. Production started in August 2018 and lasted all the way through December in Australia. Benicio Del Toro joined the cast after production had wrapped and it is believed that Danny Trejo did too, but that has yet to be confirmed. You can check out the voice announcement for Boots below, thanks to Danny Trejo's Twitter account. The Nickelodeon Kid's Choice Awards airs this Saturday, March 23rd at 8 PM Eastern.